As mentioned earlier, I haven’t attended this gaming convention in over a decade. So I am thrilled to be returning as the Artist Guest of Honor where I will be exhibiting in a dedicated booth, presenting a slideshow and holding a drawing workshop. 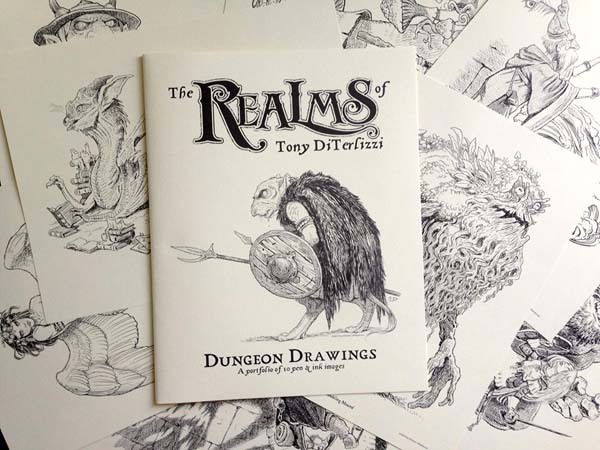 What has me bouncing like a beholder is celebrating the release of REALMS with fans who have supported me from the beginning of my career. 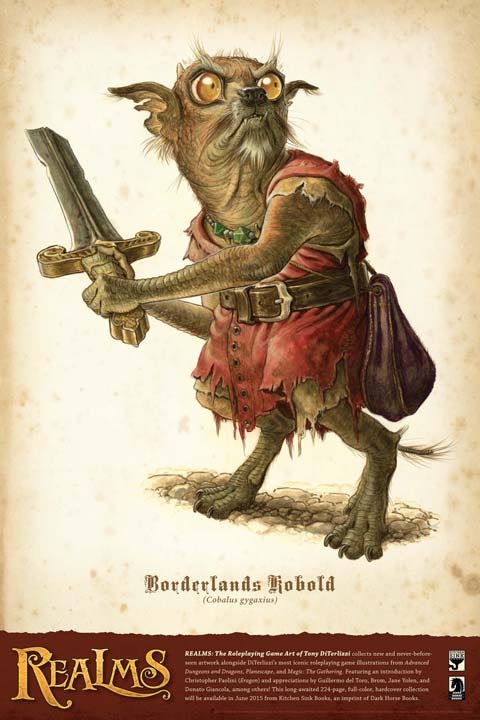 To celebrate we are giving away 50 signed “Borderlands Kobold” prints each day. One print per person, no purchase necessary. 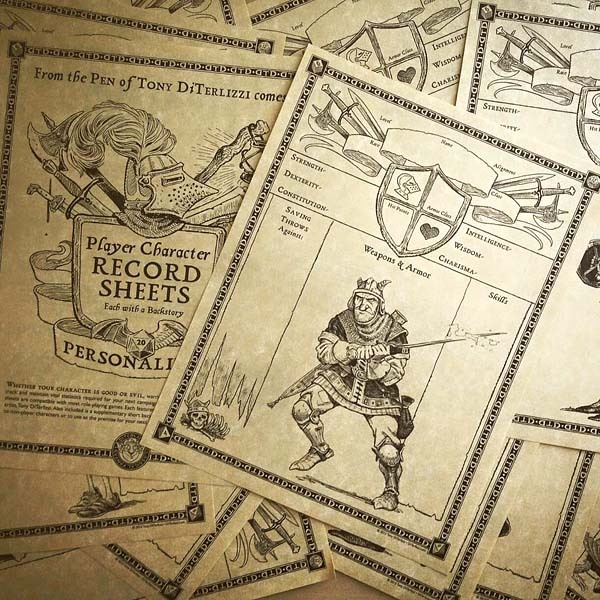 Player Character Record Sheets, which I have created before (and offer as a free download), however; these are a newly designed layout with new characters and a short backstory prompt for each persona. If that were not enough, all twenty of the characters featured in this pack will also be available as a miniature this fall from Dark Sword Miniatures. 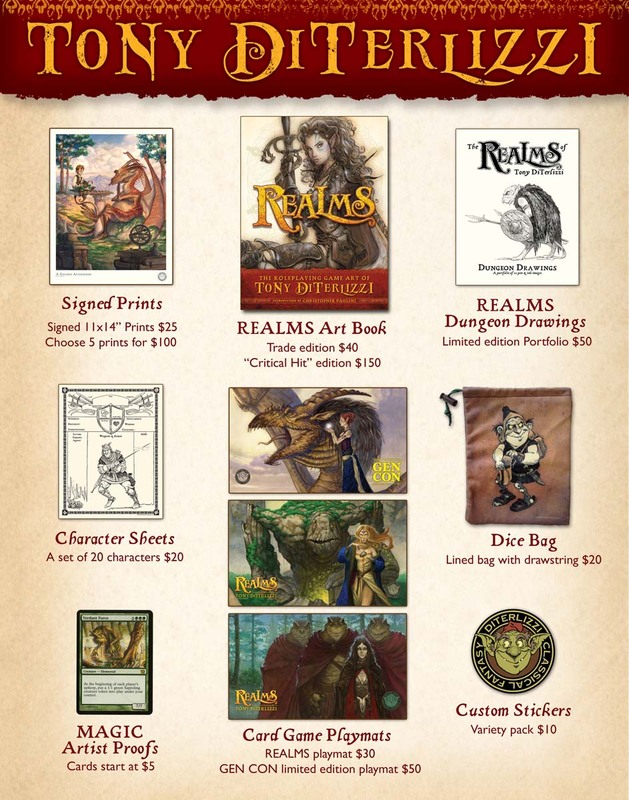 Speaking of miniatures, Dark Sword will showcase the DiTerlizzi Masterworks line at their booth and have a selection of minis for sale. 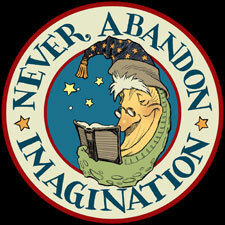 You can find them at booth#1036. 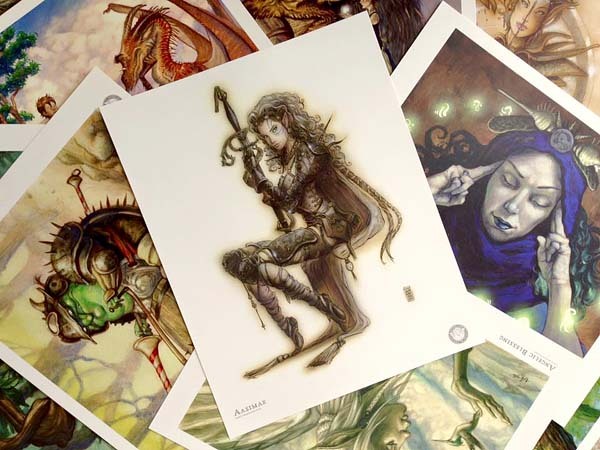 I’ll have plenty of signed “Vintage” DiTerlizzi Prints of your favorite images from Planescape, Changeling and Magic the Gathering. All are digitally printed from new high-resolution scans on 11×14 natural white Bristol board. For players of Magic the Gathering, I have three different 14×24 Magic Playmats featuring art from the years that I contributed to the game. 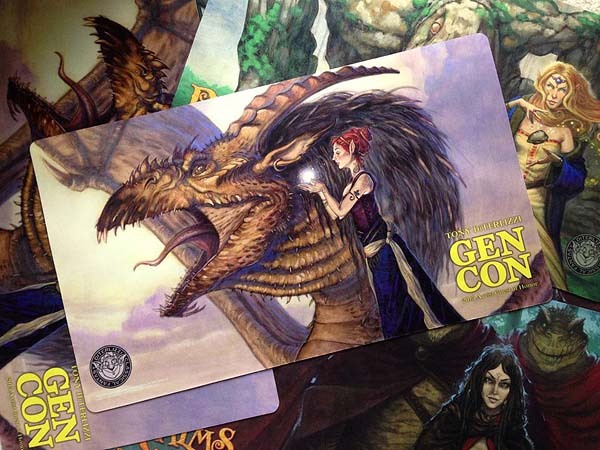 The “Gen Con Edition” mat is limited to 50 and will only be available at my booth during the convention. 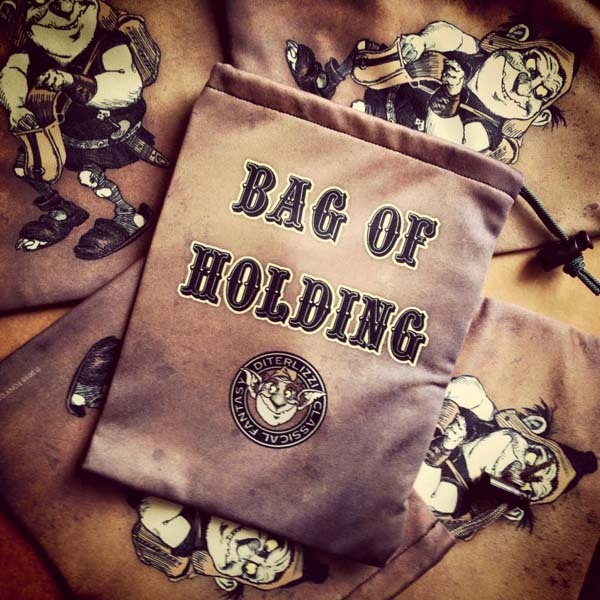 For you fellow old school D&D players, I’ve created a Bag of Holding. This lined 6×8 pouch keeps your lucky dice or cards safe from goblin pickpockets. 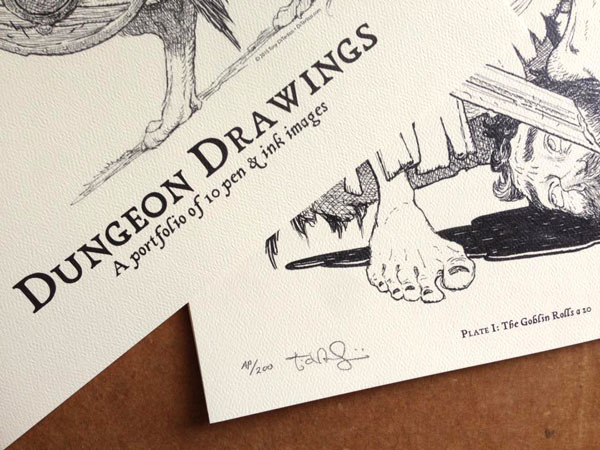 One of my favorite newly created items is a 1970’s, Frazetta-inspired 11×14 portfolio of 10 pen & ink Dungeon Drawings. This edition of 200 is printed on heavy Canson paper and is signed and numbered. 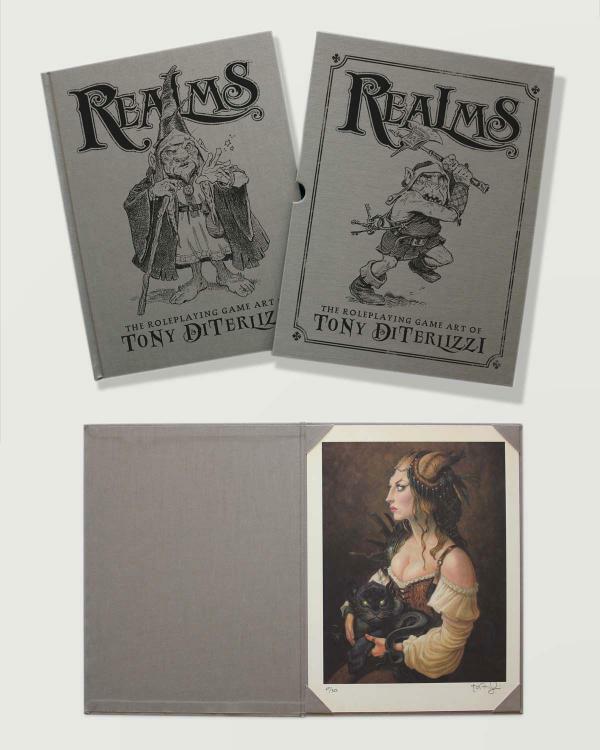 It includes new artwork as well as art featured in REALMS. Of course I will sign any books, games and cards that you bring from your collection.